While home with my family for Christmas, I read and thoroughly enjoyed John Harwood’s The Interface: IBM and the Transformation of Corporate Design, 1945 – 1976 (I also finished Rebecca Solnit’s Infinite City, Richard John’s Network Nation, and the new “Digital Art” special issue of October, none of which matched Harwood). As I was reading The Interface, I heard Reinhold Martin echoing all over the place — as he should’ve been; he was Harwood’s advisor. Harwood’s project focuses on IBM as a new kind of corporation — one that calls for a new kind of management — one for which design, in all varieties, is a critical management tool. 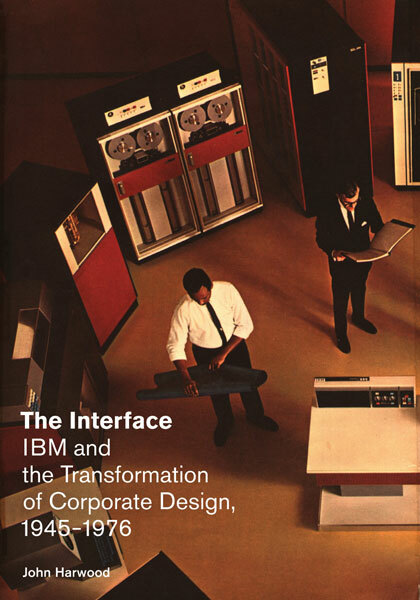 In 1956 IBM’s president Thomas Watson, Jr., hired Eliot Noyes to serve as “consultant director of design,” and Noyes brought in a crack team of fellow designers — Edgar Kaufmann, Paul Rand, George Nelson, Mies, and Eero Saarinen among them — to design not only a multi-channelled “interface” between IBM and its markets, but also, perhaps more lastingly, an “organic,” “modular” interface between computers and people and architecture. There’s lots of great stuff in the book — about logistics, ergonomics, the connections between management theory and cybernetics, the difficulties of enforcing consistent design throughout a far-flung multinational corporation, etc. — but I most enjoyed Harwood’s fourth chapter, where he talks about IBM’s use of exhibitions and films to “naturalize the computer” — to help a wary public become more comfortable with the machine’s inevitable integration into their workplaces, their schools, their everyday lives. And what struck me most within this chapter (perhaps it shouldn’t have been surprising) were the parallels between the Eames’s IBM exhibition designs and the THINK exhibition my students and I saw, and I wrote about, a couple months ago. After seeing the modern-day THINK at Lincoln Center, we immediately noted the similarities between the zooms and scalar variety in the multimedia presentations, and the Eameses’ Powers of Ten. But what I didn’t know back in October was that the Eameses’ multiscreen projection inside the IBM Pavilion at the 1964 World’s Fair was also called “Think” (of course the “Think” slogan had been in use within IBM since the 20s). Nor did I realize, from simply looking at photos of the 1964 exhibition, just how similar its design and rhetorical strategies were to those employed in THINK 47 years later. 1964 had the People Wall, which required visitors to prop themselves up awkwardly “in a pose of heightened attention and readiness” (Harwood 190), while 2011’s gallery required us to stand amidst pods of monolithic screens, wondering which of their many faces we should strive to see. The People Wall rose 53 feet into the interior of the “Information Machine,” whereas at THINK we descended a ramp, gathered in a foyer then were led into a pitch-black room; both were altitude-altering “rites of passage” leading to a disorienting space. And both offered multi-screen extravaganzas: The Information Machine featured 15 screens of various shapes and sizes mounted on the curved wall, while the 2011 gallery contained 40 seven-foot screens rising from the floor. …displaced the spectator, several times over. First, deprived of any sense of direction by the labyrinth stairs, then set in bleachers without a point of reference, then lifted into the ovoid, and at last fragmenting and multiplying her points of view in a rapid succession of film segments and slides, the spectator has embarked on a kind of pilgrimage. She has quite clearly transcended three-dimensional (or even four-dimensional) space and has come to inhabit, however briefly, an entirely new medium (191). One experienced a similar disorientation, as I described in my earlier post, in the Lincoln Center exhibition; we walked into a dark, subterranean space; found ourselves lost in a field of infinite regress; and divided our attention among the myriad screens and their reflections in the mirrored walls. And in both exhibitions, visitors were (likely) simultaneously wowed and horrified by what they were seeing and hearing. At Lincoln Center, we couldn’t help but marvel at technology’s role in revolutionizing health care, finance, agriculture, etc., yet we couldn’t forget the promise, or threat, that these “systems are alive” — that there is potential danger in placing our basic needs for survival in the hands of sentient technologies. 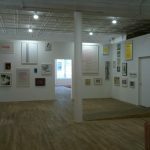 Similarly, the 1964 exhibition presented the computer as “wholly new and shocking, and [at the same time,] as a completely natural extension of everyday life” (194); “no effort was made to resolve this contradiction… The task of naturalizing the computer did not involve a true effort at ontology, of either human being or computer; rather, it involved a design logic of displacement and enclosure” (195). Finally, the 1964 Pavilion and other Eames exhibitions sought to “posit [IBM’s] activities as the culmination of scientific and technological history” (196). The Eameses incorporated a History Wall into many of their exhibitions, showing the great traditions from which IBM’s work arises, and to which it represents a culmination, an apotheosis. Similarly, at Lincoln Center, we emerged from the multimedia gallery into an exit hallway featuring 100 iconic moments from IBM’s 100-year history. Once again, IBM finds itself “as the end of a great narrative of scientific and artistic achievement” (196).